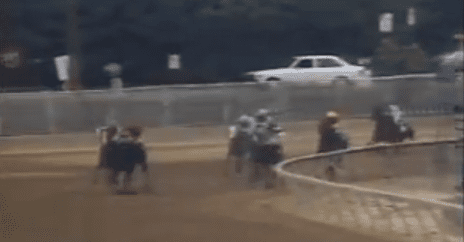 Should Codex have been taken down in the 1980 Preakness? The 1980 Triple Crown season began with a stunner – Genuine Risk, at odds of 13-1, became the first filly to win the Kentucky Derby since 1915. Two weeks later, a record crowd of 83,455 turned out at Pimlico to see if Genuine Risk, owned by the Firestones and trained by LeRoy Jolley, could take the next step in a bid to become the first female Triple Crown winner. The daughter of Exclusive Native came into the Preakness favored in an eight-horse field that included newcomer Codex, a California-based colt trained by D. Wayne Lukas. Codex had not run in the Derby because he was not nominated. As the horses emerged off the far turn, it appeared fans were in store for a thrilling stretch duel, as Codex held the lead along the rail but Genuine Risk was mounting a strong bid to his outside. Off the turn, Codex, under Angel Cordero, Jr., drifted wide and appeared to bump the filly just as she was hitting the peak of her run. She seemed to lose momentum, and Codex kept to task, pulling away to win by 4 3/4 lengths. Jacinto Vasquez, the rider of Genuine Risk, claimed foul, saying Cordero had not only intentionally drifted wide but also hit the filly with his stick while whipping Codex. After a lengthy delay, the stewards ruled no change to the order of finish, to the chagrin of many fans in attendance and millions watching at home. Pimlico was flooded with calls of protest, but two weeks later, the Maryland Horse Racing Commission voted 3-1 to deny an appeal of the stewards' decision. Jolley's assistant, John Nazareth, wasn't quite so accepting the day after the race, telling Sports Illustrated's Bill Nack Genuine Risk had a bump on her nose. “You make one bad call, O.K., but three? Impeding, hitting and contact?” said Nazareth. Winning trainer Lukas told reporters: “My horse has a bump on the head, too, but he got it in his stall. Unless you can see her jerk her head up, she didn't get hit. As for Cordero, the jockey said he received angry letters and even death threats for months afterward. “Every kind of letter that came after that was bad. They got very personal,” Cordero said. “They called me a disgrace and told me to go home to Puerto Rico. It was something that I didn't enjoy. Genuine Risk went on to finish second in the Belmont, where Codex finished seventh in the final race of his career. Genuine Risk was named champion 3-year-old filly in 1980 and remains the only filly to hit the board in all three Triple Crown races. This entry was posted in Triple Crown, Videos and tagged 1980, angel cordero, codex, d. wayne lukas, genuine risk, Horse Racing, horse racing history, jacinto vasquez, Paulick Report, pimlico, preakness, Preakness history, Preakness Stakes, Scott Jagow, Ten Preakness Moments, thoroughbred, thoroughbred racing, Triple Crown history by Scott Jagow. Bookmark the permalink.